Before the war with the Kalakeya. Before Katappa killed Baahubali. Before the death of Sivagami. Two young brothers competed for the throne. One would go on to become king, and the other would go on to become a legend. 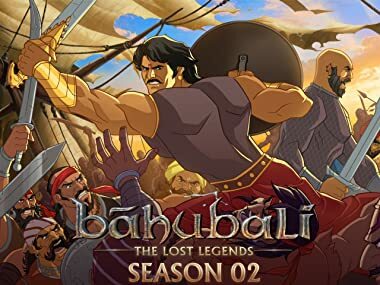 Experience the secret stories from the world of Baahubali in this all new animated series. Desperate to find a cure for the ailing Katappa, Baahubali journeys to defend the great library of Jwalarajyam from a Barbarian assault. Finding Jwalarajyam surrounded by a gigantic horde of Barbarians, Baahubali must defend the library with only a handful of men. As the battle to defend Jwalarajyam begins Baahubali must come up with a strategy that will help him and a handful of warriors fight off hundreds of armed Barbarians. The Barbarians are at the gate! As the walls of Jwalrajyam crumble, time is running out for Baahubali and his allies! Baahubali learns that the tiger cubs he rescued are now attacking others and realizes he must take them back into the jungle - their natural home. But a crazed hunter is tracking Baahubali and the tigers, wanting to make him the ultimate trophy! To find the special ingredient needed for a cure to Katappa's illness Baahubali must journey to the one place it grows - inside an active volcano! Everything changes! The battle for Mahishmati intensifies as battle lines are drawn! After pirate attacks on Mahishmati's navy grow, Baahubali is ordered by Sivagami to infiltrate the pirates den by posing as a pirate. Baahubali and Katappa now find themselves undercover on the high seas surrounded by danger and death! Baahubali meets Kaala Khanjar, the dread pirate who attacked Mahishmati's ships, but finds him and life as a pirate to be different than he imagined. Baahubali must discover what dark secret the pirate king is hiding. As Baahubali grows closer to the pirates a choice is placed before him - a life of living by the sword or ruling the seven seas. As a mysterious figure arrives in Mahishmati to challenge the prince of the kingdom for a past transgression, Bhallaladeva is put in a position he thought unimaginable - to fight for the honor of Baahubali! The truth about Pradhan Guru's origins finally revealed! Pradhan Guru moves his pieces into play for his final gambit - a carefully orchestrated attack on Mahishmati from the inside! Baahubali and Bhallaladeva must race against the clock to save their kingdom! Sivagami faces Pradhan Guru in the battle for Mahishmati as the great game begins!